The Wrightsville Beach Paddle Club will be hosting a Waterman's Expo and three standup paddle races this weekend. The anticipated weather forecast looks great for the event and paddlers are pumped for this elite challenge. p.m. to 8 p.m., with races to take place the following day. (Alternate weather date November 20th). The day's events will kick off with the Kids Race at 9 a.m. followed by the Elite Surf to Sound Challenge at 10 and finally the Intermediate Harbor Island Challenge at 10:30. The Waterman's Expo will take place that afternoon, from 12 p.m. to 6 p.m. and admission is free. Those interested in racing can choose to register online for either the Surf to Sound Challenge (6.5 miles) or the Harbor Island Outer Loop (4 miles). The latter is perfect for intermediate and less experienced paddlers while the former is geared toward advanced paddlers. Registration for the Kids Race is free for children 12 and under. Proceeds benefit FOR Masonboro Island (http://formasonboroisland.org). 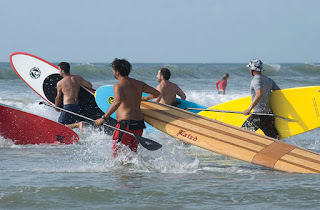 Get more information on the NC Surf to Sound Challenge or register online at www.eventbrite.com/event/2252332788.